Already well-known Metal framework has become an indispensable tool for building the great games and applications, which you can find in Metal by Example. Metal is available for devices using the Apple A7, Apple A8, and Apple A8X, combines the similar functionality with such well-known API as OpenGL and OpenCL. How did this tool become useful for Indeema engineers I will tell you below. Our team of developers faced the issue of simulating different prism shapes that are between the object (image) and the camera so that the prism refracts and reflects the picture as the most realistic and yet get other lighting effects such as chromatic aberration and chromatic glow. Also, the prism should be movable, and all this for mobile platform iOS8. Related: New trend of image editing – iOS apps? First of all, our programmers started to search for the current solutions in order to save time. They found a good resource where a small tutorial or source code can be downloaded. Our team undertook to examine the code and the first change was the replacement of shapes (prisms), ball looked impressive. At first glance it looks nice and fair, but after deeper investigation it became clear that the algorithm for the solution of the problem does not fit. The point is that the algorithm, programmers found, works in the way that the image is refracted only on the visible sides of the cube, meaning that there is no internal refraction and reflection, and this, in turn, makes the result less realistic. Looking for the solution in the Internet, we found out the principle of ray tracing. We decided to get rid of 3D world and realize everything using the shaders. We simulated 3D world with one figure and area with the image in it. Then, trail rays for each pixel of the image and check if the beam crosses planes figures. When crossing, calculate the refraction and reflection of the beam. We form a new image. In details we will examine the algorithm below. After the implementation of this algorithm we got the result that we comforted. However, if you examine the technology of ray tracing you will find out that all sources claim that this method is resource intensive. As the result, it has created a new obstacle for us, as the mobile device processor is not very powerful. The resource intensity of algorithm led to restrictions on the complexity of the prism, namely the number of triangular planes that form the shape. This means that the algorithm is suitable to a small variety of shapes exposed to the current ray tracing technology. In the case of more complex shapes FPS reduced to 10. We avoided this issue by creating the ray distribution map. If the figure does not change the location and is not rotating, the refraction/reflection are the same for prism. In that case, we decided to generate the map of refractions only when changes are made. Hence, the 3D simulation can be created more realistic. by changing the position or turning the figure, user does not see the results right away, but only as the changes are over. When rotating figure’s frame is displayed on the screen. Check out Ray tracing with Metal framework at Indeema Software video that is filmed as a result of algorithm realization. Related: How Much Does It Cost to Develop an App? prismIntersectionCount - number of the ray’s refractions or reflections with the object. points - array of points of a triangle (V0, V1, V2). 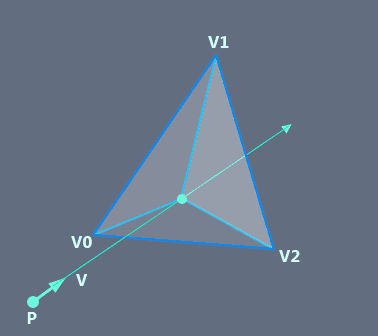 edge1, edge2 - vectors of triangle’s coordinate system with a centre point V0. edge1 = Vector3D(V1 -V0), edge2 = Vector3D(V2 -V0). Below is a structure that is used to render textures to simplify certain provisions of the prism. This structure is designed for full HD pictures (1920x1080). It works by the following rule: each pixel with coordinate (x, y) assigns to three coordinates for each color RGB, thus realizing simultaneously chromatic aberration effect. The map for one position is formed and used to process the image to its next change. To make things simple, we need to describe the structure of the plane, which consists of two triangles. 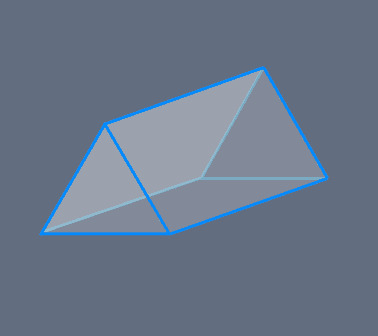 triangles - triangles forming plane. The structure of imaginary world which is represented as a cube. planes - planes forming a cube. eta - coefficient of prism’s refraction (for the glass eta ≈ 1.6). 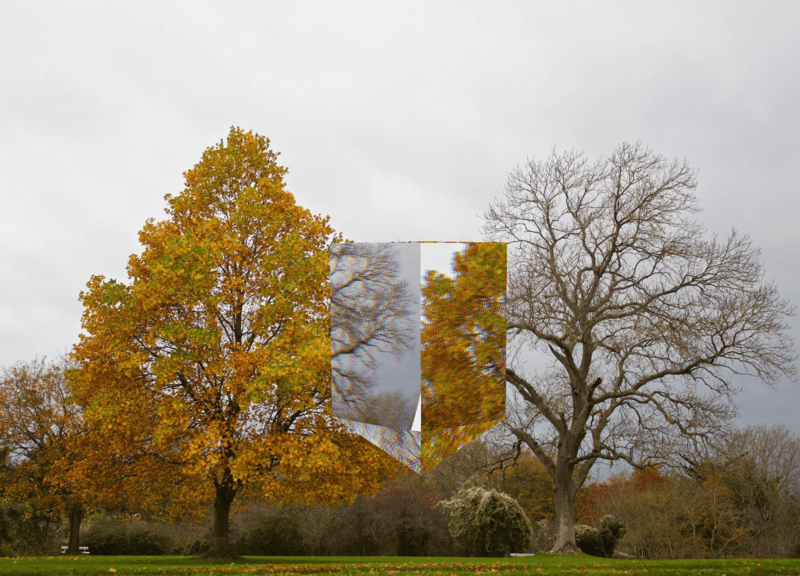 The structure which describes the scene contains the skybox object and a triangular prism. The function of ray’s intersection with triangle. This method is based on the algorithm described in details in the article. The method takes the triangle and the beam, and after calculation returns the object “intersection”. The following method implements the intersection of a beam with a plane using the method of beam crossing with a triangle, which is implemented above. Intersection intersectTriangle(Triangle triangle, Ray ray). Method which calculates the intersection of the beam with an object of a triangular prism. 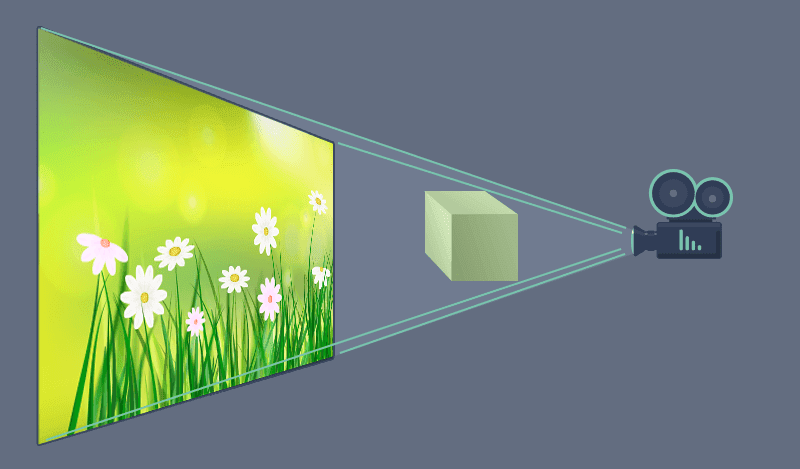 The function of ray tracing through the scene with triangular prism. This function is used in the main shader. 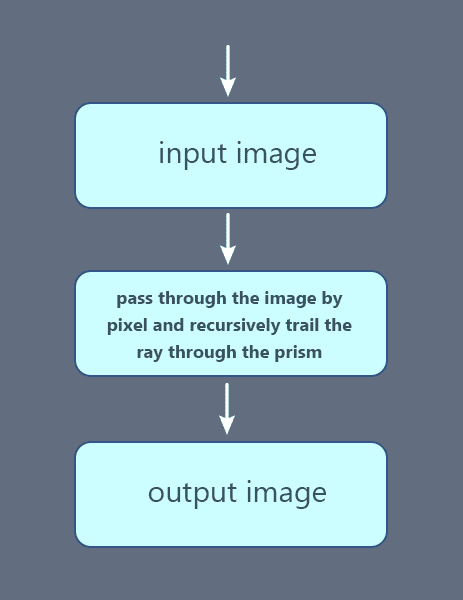 The function replaces a recursive passage of ray tracing with a “while” cycle, as the Metal shader language doesn’t support the recursion. The result of this function is the intersection of the resulting beam with a skybox. The next shader is used for the map generating in conjunction with an output (resulting) structure. That means that for the certain prism provision this shader is performed only for the first time, next time the structure is processed by the other shader, which uses a map to calculate an output texture. Get the height and width of the input texture. Condition of an output map generation stop. Conversion of texture coordinates, taking into account the ratio of height to width (aspect ratio). Create a beam object with the beginning at the point of camera location (0.5, 0.5, 0.0), with the direction to the current texture coordinates in the point z = -1. Start the process of calculating the intersection of the beam with a prism, which returns an object “Intersection” with the characteristics of the beam current passing through the scene. If the section of the prism is found, which is checked by the number of crossings in the object “Intersection”, we calculate the RGB colors for the current pixel and store them in the map. If the intersection with the prism is not found - record the color of input texture for the current pixel in the map. 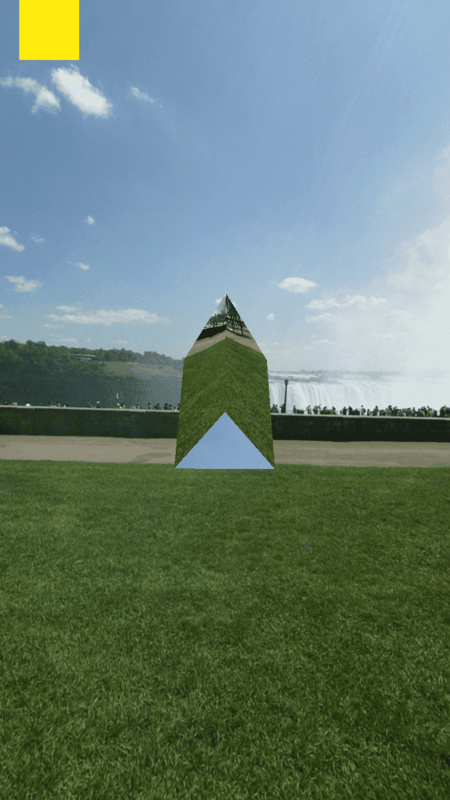 This shader can also be used for the other prisms: cube, pyramid, octahedron and others. 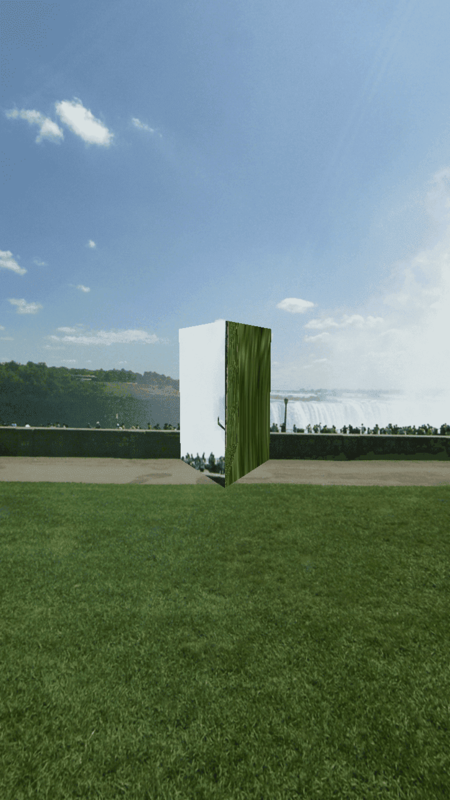 In this case you need to write appropriate structures for these prisms, describe object scenes and realize the ray tracing function for the scene. We are looking forward to seeing the release of new iPhone 6S GPU which will implement the ray tracing, that will allow us to make the small changes in the algorithm and to get excellent results as well.